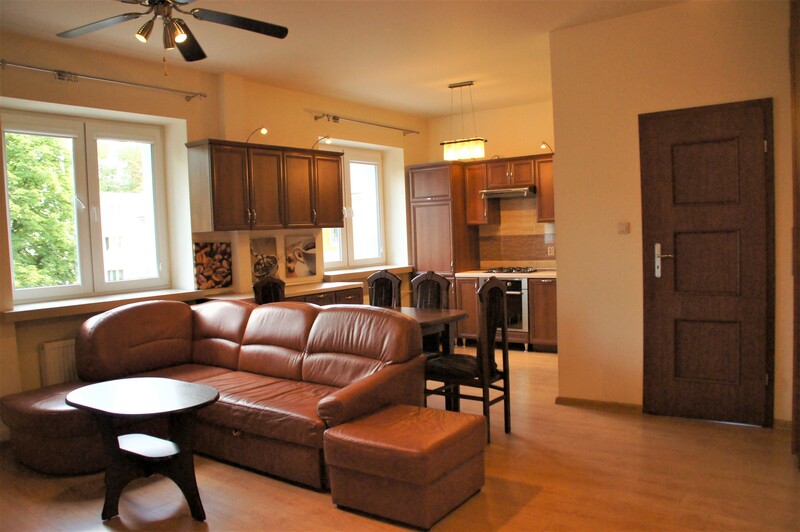 For rent a 2-room apartment, cozy, comfortable, luxuriously furnished, ​60 sqm, located in a quiet area, halfway between the city center and the international airport Okę the neighbourhood Medical University, business centers, Novotel, Hotel Sound Garden. Perfect for a couple or single. The apartment has undergone a general renovation under the architect’s design, making it comfortable and very functional. It is equipped with two large TVs with a diagonal of 50″, air conditioning and a safe-deposit box embedded in the wall. The spacious bathroom with window has a bathing cabin with radio, sauna and toilet with bidet. The apartment is located in a low, 2-storey building, renovated and after renovation of the facade. THE PRICE INCLUDES: administrative fees (heating, building renovation fund), taxes. Additional costs: PLN 250 garage, internet and cable TV subscription according to the price list of the the selected provider, and media according to meters: gas, electricity, water. Refundable deposit (one month rent fee). Comfortable, real leather sofa in living room. 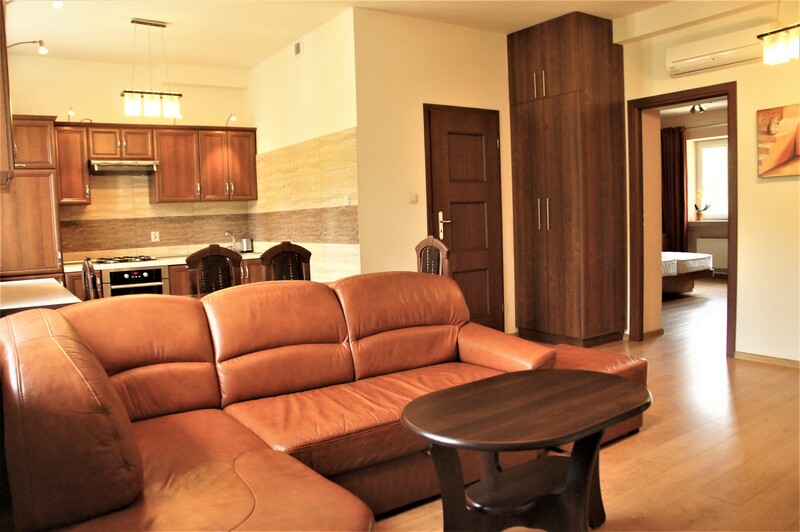 Fully equipped kitchenette (fridge, dish washer, cooking and baking oven), beautiful tiles on the walls. Dining section: full size table, 4 chairs. View from the kitchenette to the entrance door. Large screen TV on the walls. Elegant mirror at the entrance and the door to bedroom. Spacious bedroom with king size bed. Feel the spacious bedrrom at your disposal. Bedroom equipped with large screen TV set. Bathroom furnished with elegant wash basin, beautifully framed mirror and shower cabin quipped with massage and sauna function and radio. We invite you to the presentation!